THE LOOK, THE FEEL, AND THE POWER OF A VINTAGE CORVETTE RACER, ALL PUT TOGETHER IN A PACKAGE THAT CAN BE ENJOYED WHERE YOU DO ALL YOUR DRIVING....THE STREET!!!!! Those are the words that head off the feature article on our prototype Road Race Inspired 1968 Street Corvette in Hemmings Muscle Machines August 2007, and we concur with that statement. 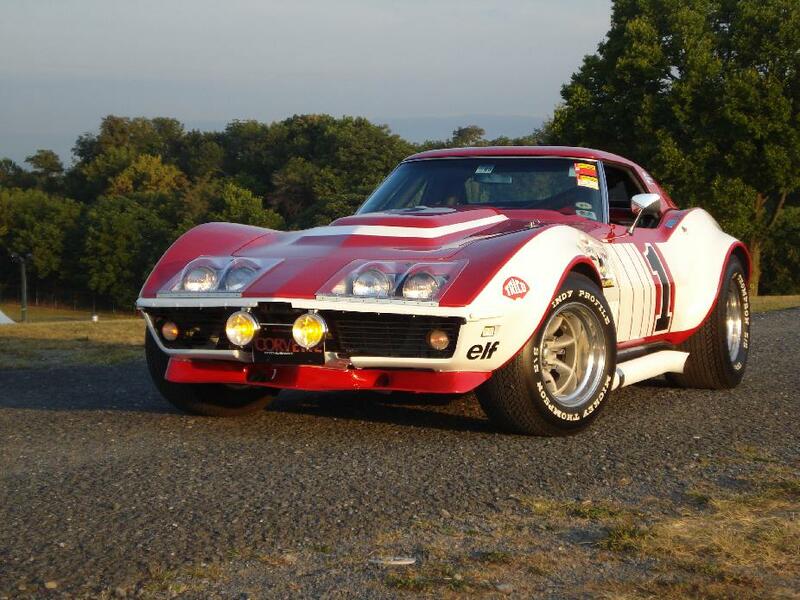 The early C3 road race prepared Corvettes made a name for themselves by tearing up the race tracks all over Europe and the US in the late 60's and early 70's. Their great performance and rich history, along with their uniquely striking good looks have made them legendary in Corvette circles and beyond. Owning one of those original cars is something most collectors can only dream of, due to the cars rarity, and extremely high price tags. Most importantly, those cars were purpose built racers, and were not streetable. Always being fascinated by these cars, combined with my belief that cars should be driven and enjoyed, I decided to commission our crew to build a Corvette that would fulfill the essence of the vintage racers, yet would be fully streetable. The result was our prototype 68. WE HAVEN'T LOOKED BACK SINCE! Many exciting builds later, we continue to build these SUPER VETTES, for the most discerning customers. If you would like more information on how to have your own Road Race inspired street brawler, feel free to contact us. We can use your own existing Corvette for a build, or help in finding you the right donor car. Look at the pictures below for some inspiration!!!!! Early in 2009 we were contacted by Doug Plette AKA "Snowman" of Houston, TX to help build "BRUISER", an 850HP on pump gas 71 convertible that was being built in conjunction with Corvette Enthusiast and showcased on Corvette Forum.com. Doug is no stranger to special one-off Corvettes, and has a number of magazine cars under his belt already.Needless to say,when we were invited to do the bodywork and paint on the car, we jumped at the chance. The only catch was that the work would be performed in Houston!! Without hesitation we packed up our tools and headed across the US to "Get it on"! Our own designed flares, as well as our "straight as they get" bodywork are just a few of the the many special touches Bruiser has. Some very talented people were involved in this build and it shows. This car is already three issues deep in it's feature in Corvette Enthusiast Magazine, the latest being the Jan. 2010 issue where "Bruiser's" fire breathing 555ci Big Block is gracing the cover!! There will be more to follow. We liked Texas so much, that we are working on opening a second location there!!! Here are some pics of the completed car, as well as some of the build process. A PHOTO-OP WITH LANCE MILLER OF CORVETTES AT CARLISLE,WHO CAME BY TO CHECK OUT THE CAR. TAKING AN IN-DEPTH LOOK AT OUR RIDES.